Greetings from Braila, in southeast Romania. It is now Thursday. October 21st, 2010 and I have been here a week, on mission s with Ina Aust and Steve Inklebarger, husband and wife, of Chehalis. Our flight from Seattle took us through Amsterdam and then after a four hour layover, on to Bucharest. From there, Marin Tiripa brought us to the Tiripa household in Varsatura, a town just outside Braila in Galati Province of Romania. The journey began at 10 AM in Seattle at the airport and ended at 8:30 pm in Varsatura, approximately 27 hours later. The lower level has an office where Christina & Marin sleep temporarily, living room with fireplace, the only heat source, kitchen, pantry, and garage. We house four cats and two geese presently, which you will understand better later. Our arrival was timely in several respects. Brother Paprika (Peter in English) passed away and his services were underway the evening we arrived. 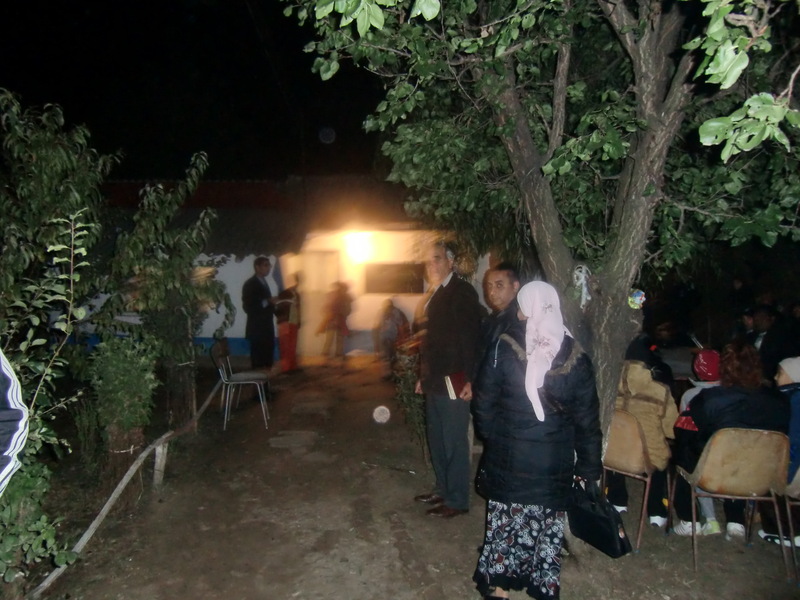 Following a brief rest, barely 11 hours after arriving in Romania I was conducting funeral services in Llanca (pronounced Yon-ka) gypsy village. My message came easy as Paprika, age 44, was a good friend. He was the first gypsy we baptized in the Danube River, back in 1997. On that occasion some of you may recall the debate we had with he and his wife the week prior. Pastor Streghor, Marin and Christina, and I went to Llanca to visit him and his wife, bearing gifts of loaves of bread, honey and clothes for his two small children. 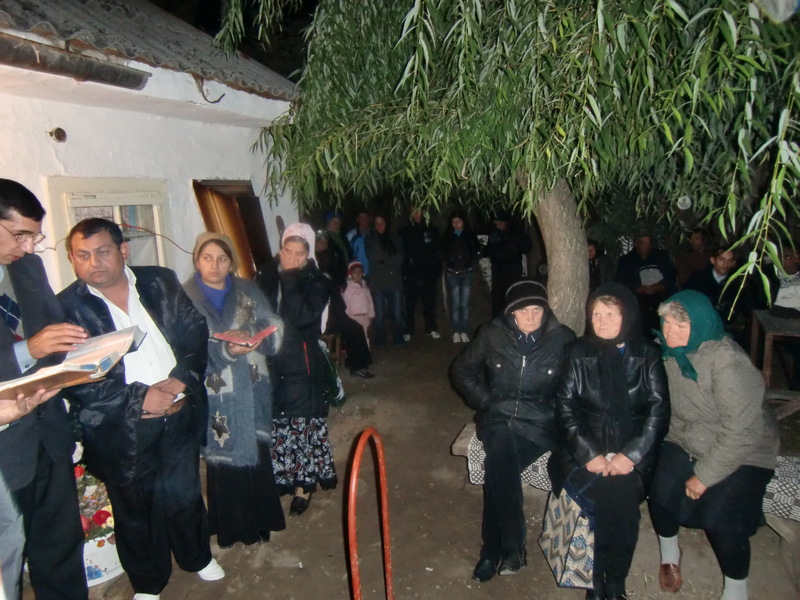 They had announced their desire to be baptized in church a few days before but then the gypsy elders threatened them, assuring that he would be struck with paralysis for defying gypsy life if he permitted this act. Paprika and his wife were confused and literally terrified. We spent about four hours that very morning with him explaining the power of Jesus and how He would not permit such a tragedy. The debate was passionate and of huge weight as they were the first in the village to accept Jesus and were the acknowledged leaders of many there. I recall the setting well. It was a rainy Saturday morning. Crossing muddy fields down a long farm road in the poor village, we arrived at their simple two room white house. The large room housed a cow to preserve it from theft or injury in this outlaw area. Separated from the tiny living area by several boards, the small living space had a cast iron stove used for heat and cooking, two small cupboards, a built-in platform bed where they all slept, and some boxes used as cupboards for their clothes. A porch entry was the only other covered space in the small house. Leaving after our visit, I recall the children being handed candypacks by Pastor Streghor while seated in a broken wooden wagon in a clump of Chrysanthemum plants, the only vegetation in the yard. To my thrill, the following Sunday morning both husband wife showed at the Danube River, being baptized together, the first testimony now followed by hundreds in this Braila District! Brother Paprika died suddenly of injuries sustained in a farm accident. There were probably in excess of 250 gathered in the night air for his tribute, mostly gypsies and many still non-believers. I eulogized my friend and then spoke of the parable of the ten virgins, encouraging the faithful to keep vigilant and prayerful in these perilous days. Three Caleb gypsy pastors and our Romanian senior Pastor Brother Streghor spoke as well as a brief greeting from Ina Aust. Saturday brought even more heaviness to my visit. Vasile (Lester in English), the older brother of Marin Tiripa, is dying of cancer and effects of alcoholism. Vasile has been cared for for years by Marin, actually since they and their sister were rendered homeless when Vasile was 11 and Marin 9 years old! The severities of their youth were too much for the older boy and he has always led a difficult and unconventional existence, surviving most of the time by working as a farm hand and carpenter, but unable to shake his dependence on alcohol. I recall very fondly the one day he honored me by bathing, shaving, and coming to hear me preach in a borrowed blue suit! His attire was so strange to him that his own dog did not recognize him when he returned to his house, barking incessantly! 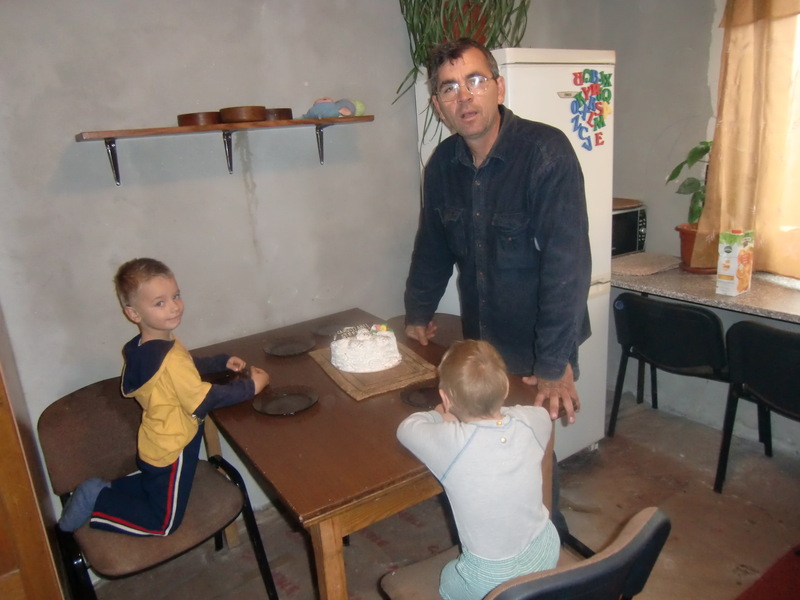 Vasile always felt unworthy of Jesus love and grace, but he was at the same time respectful and supportive of our work, helping on doing for others, repairing widows’ homes without charge, delivering candy pack cases, unloading Caleb containers, and the like. 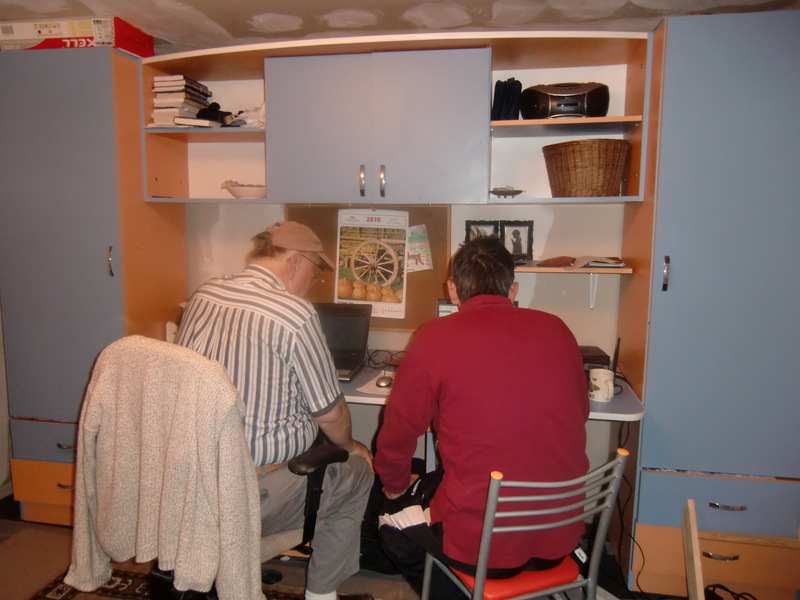 On Saturday Marin and I found Vasile in his two room house unable to get us or care for himself. The modest fire had gone out, only a few slices of orange and a chunk of bread occupied his dinner table, and he clearly was in severe pain. He wanted to go to the hospital, even though he knew and expressed that that is where one goes to die! Gathering Vasile, we took him to his mothers’ home where he bathed and borrowed a pair of pajamas. (The hospital provides nothing and you must have pajamas to be admitted) He said good bye to his mother and stepfather and we then drove him to the hospital. Analysis showed his liver and pancreas were not working and that he has stomach cancer far beyond treatment. We buy him a cup for drinking water, apples, bread, toothbrush and a bar of soap, and he is admitted at 3 pm Saturday. This means he gets a bed and we now must hire doctors to treat him and to buy any indicated medicines and treatments as they are administered. 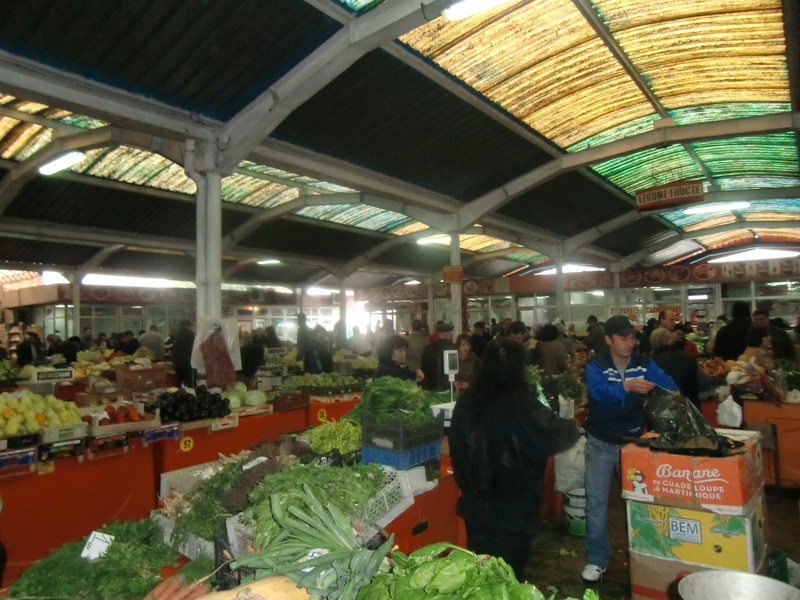 An Analgesic is suggested for the pain so we then seek out a Farmacia which has it in stock. A willing doctor was located through friends in the church and he commands $500 US for examining and recommending a course of treatment! Anyone not liking United States Medicine should watch the third world carefully! While waiting in Admissions here I watched an endless parade of people coming in. The area was dirty, dark, and unkempt. A man arrived with a severed finger and was told he needed to find an urgent care hospital as this one was general care. He was sent away holding his bleeding hand. Five siblings were gathered in a corner counting their money to accumulate enough to buy pajamas in the market place so their mother would be admitted. An old man was carrying a basket of basic bread and pork hoagies (no condiments, just bread and a very thin slice of meat) he was selling to patients for dinner, should they not have friends or family to bring meals. One delusional lady was screaming constantly in the waiting area, obviously facing some demons in her head. The parade of ambulance patients seemed endless and each conveyor was given a $20 cash reward for bringing the patient to this hospital. They were each assembled in the receiving area until family or friend arrived to negotiate care! It was five hours before the retained doctor completed his exam and his conclusion was Vasile was indeed terminal but for an additional $1000.00 they could treat him giving maybe four or five more days! They moved him to Oncology and awaited the funds to proceed further. The family concurred this would be a foolish expenditure, given they simply did not have the funds having already expended the $500 for doctor and incurring $100 a day for the hospital stay (To be paid each day by 8 PM). Marin and I returned to the Tiripa home and gathered Ina and Steve to take out for Pizza for lunch. We dined at Bella Pizza but the consequences were severe. I got sick as we arrived home. It was quick and efficient. That night, Ina and Steve and all the Tiripa children who ate leftover pizza, became severely ill. Four days later, Ina and Steve are “rocky” at best! The culprit is believed to be mushrooms, Danube water, or spoiled meat as we split a Hawaiian Pizza. Only ones not affected were Marin (system like an army tank) and Christina and Elisa both of whom did not eat pizza. Sunday morning service was at Chiscan Church, a near by village. Ina gave a greeting as did Steve and I then preached on The Seven Curses Removed by Jesus Atonement. 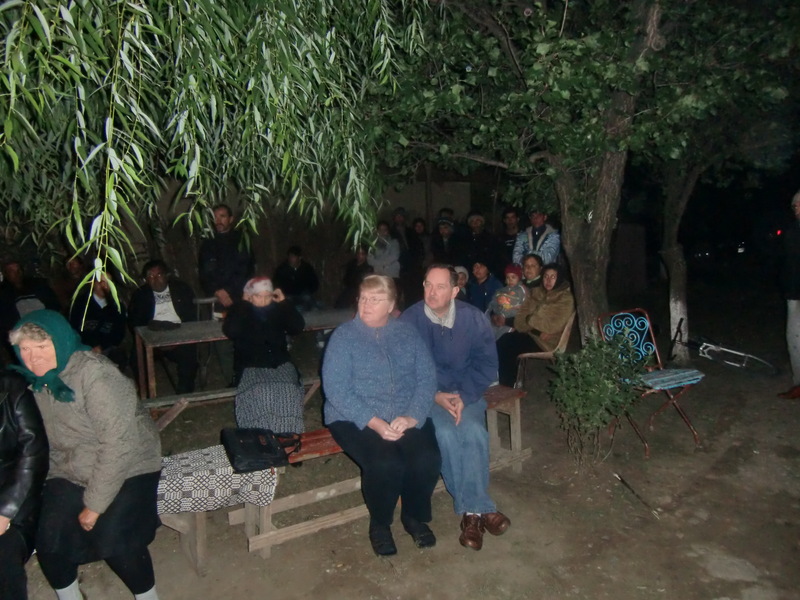 Pastor Aurel was very excited after the service and invited us to leave Friday for three days touring the new Pentecostal Churches in the Danube Delta with him. 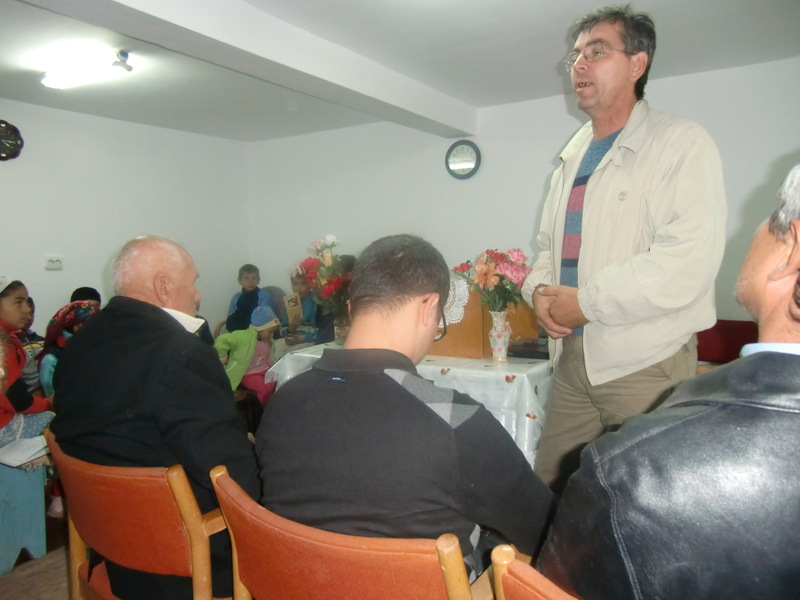 He is District Director for the Pentecostal Union in Southeastern Romania and I have worked with him many times before. 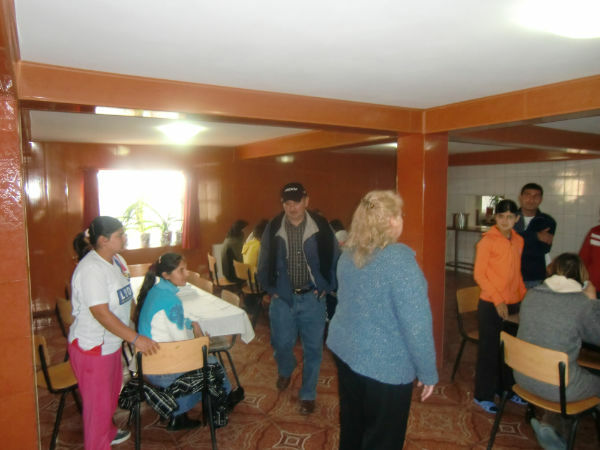 We returned to the Tiripa home where Steve reported to bed, Ina prepared for an evening service for ladies in Chiscan. And I prepared for evening service in Braila. Our programs went well except I had a failure in translation. Marin backed out at the last minute as he was concentrating on Vasile in the hospital. I was handed over to Livio, a Romanian sailor with little English skills, to translate for me. My message did not go well but all were polite and welcomed me back. Returning to the house, Ina and the children were severely ill. She ran a heavy fever most of the night and basically stayed in bed Monday and Tuesday, alternating with Steven. I ran soup, tea and water trips up and own the stairs, and did errands with Marin in between. 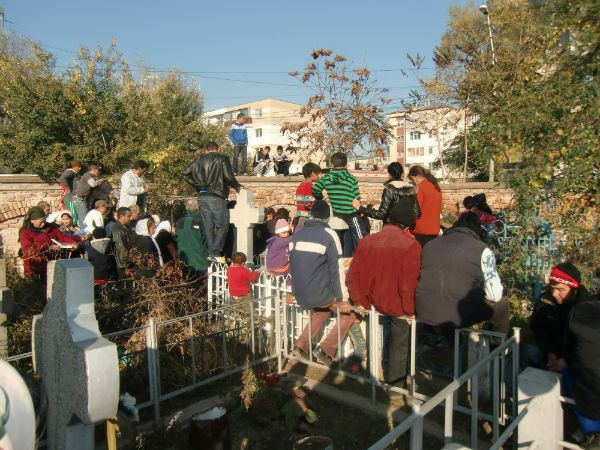 Monday we visited Vasile and went to the church elders of two districts trying to arrange a burial plot. Both refused because Vasile did not reflect a Christian life and they were therefore uncertain of his fate. This condemnation was very hard for Marin to accept and I was relieved I was here to be with him. Monday afternoon we visited several sick including gypsies and Romanians, as that is customary the one day we do not have church services. Tuesday we made the same preparations for my friend Nicoletta, mother of seven, as she was admitted to the same hospital in terminal condition with cancer. 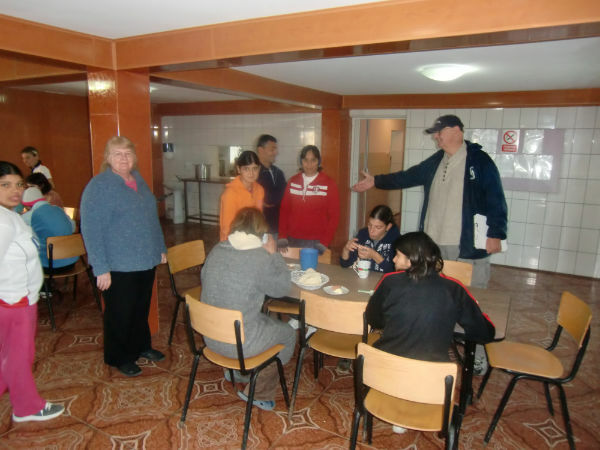 A prominent member of the Braila Church when I came here in 1990, she served Caleb Ministries and hosted our visits often because her English skills are acceptional Her husband abandoned her and the seven children, running off with another to Spain. She became a recipient of Caleb goods and clothing and we have sponsored one of her children through college in Louisiana! 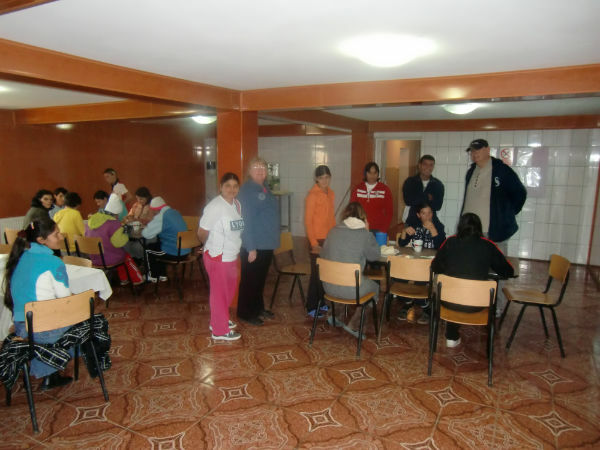 Now we are taking meals to bother Vasile and Nicoletta, among our other activities. Still weighing on us is the Aunt of Dana, the nanny in the Tiripa home, passed away last Thursday and preparations are being made for her service once relatives from Germany can arrive. You get a very real sense of the temporary nature of this life in the fall in Romania because life is so basic and bare-boned. Brother Nic from Galati brought most of his family of nine children to visit and sing for us as a surprise greeting Monday night. He lives about 60 miles away and we promised to visit soon. (He has one Downs son we supply with Glycobears and does Marin and his brother-in-law Nukutsa). We ended the evening visit with household prayer, each on our knees on the living room floor, once I provided a scripture lead. This season of prayer is traditional in Pentecostal homes for any visit, often at first arrival and then when leaving. The power went out in Braila District, leaving us in the dark most of Monday and Tuesday It was not that unusual here in the rural area but the water was turned off as well, giving us a challenge in caring fir our sick. In times of good mood I was passing Ina and Steve’s room moaning “bring out the dead, bring out the dead”. Tuesday after errands, Christina took me to a daytime prayer meeting with four others in attendance. It was across town at Sister Muras’ modest home. We had a good time with songs and prophecy. Then Tuesday evening Ina and Steve were well enough to go to Chiscan services again where I preached in Deuteronomy 30:4-16, Loving God with all your heart, mind and soul. Service was followed by an appreciation dinner in the church basement, but unfortunately pizza was served. Ina and Steve returned home ill again. Christina and her friends and I discussed at some length what they call “Despair of the Danube Ladies”. 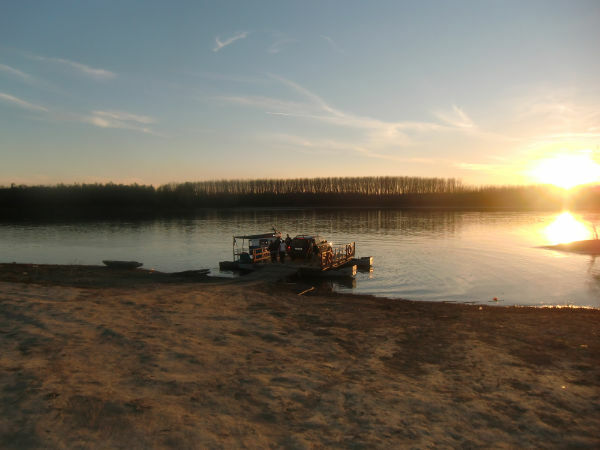 This is the strong belief that many ladies and even men are driven to suicide in the Danube due to the demands of Romanian and gypsy customs. They want to establish counseling and awareness programs to curb this evil. There is no doubt in my mind of the need. The “macho” men enslave their wives by demanding big families because it is “customary”, leaving them living in poverty and destroying the health of the ladies. The man must consent to any medical procedure terminating the ability to conceive, abortion, or fertility. The medical profession and the church enforce this principle without waver. To even address this issue publicly will resort in your being ostracized, yet we are called to counsel on this with the women frequently, in both gypsy and Romanian homes! I was asked to do the Wednesday Night service again at Chiscan, but it got replaced at the last minute due to attending to Vasile. The doctor was assuring us his time was now very short so Marin asked I put the issue of salvation to Vasile once and for all. We went to the hospital again, bearing his supper, about 6 pm. Vasile was awake and even able to walk a little. He accepted our gift of new pajamas and ate his dinner. Once rested, Marin translated as we talked. I reviewed our years of friendships and adventures (16 years I have known Vasile) and I then put it to him that he may not leave the hospital on his own, that this life was terminal. He concurred and squeezed my hand acknowledging our bond of friendship. I told him I was indeed a sinner as were we all, and that I needed to ask forgiveness of my God and to repent of my sins. He agreed he did as well, and I then read Romans 10:9 and 10. He said he did repent and regretted having disappointed God and so many others. I asked if he acknowledged Jesus as his Savior and he did, unequivocally. We cried, laughed, hugged and loved on each other, Marin, Vasile and myself! There were seven other patients there observing as we wept together and I am certain each was impacted by this testimony. Vasile is a humble man who always felt he was not good enough, living in the shadows of others, but his belief in Jesus is clear. It is church hypocrisy and judgmentalism that impeded him on many occasions, a big danger in the super-spiritual side of Romanian Pentecostalism. It is now 5 AM Thursday and I will close as I am very tired. Sorry to take so long in writing but I have been very busy as you can imagine. 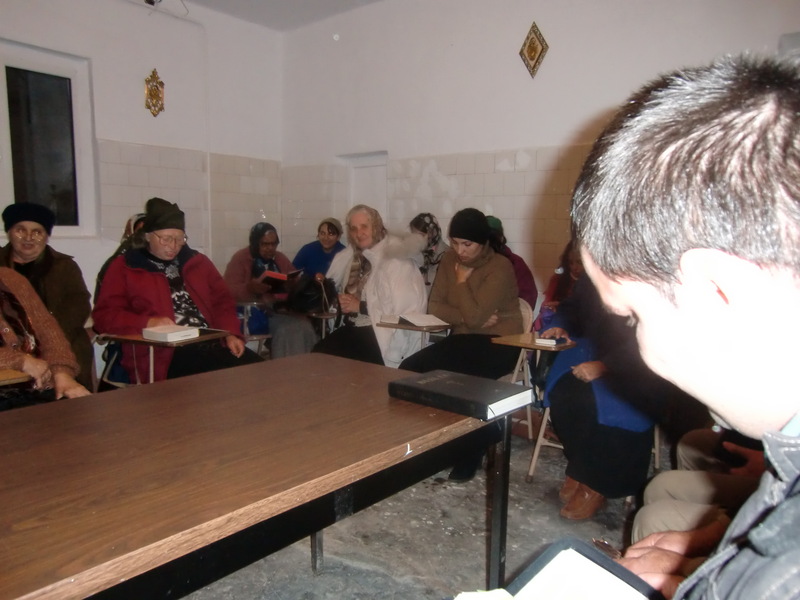 The program is church tonight Thursday in Braila, and then leaving Friday afternoon to the Delta to preach twice daily in villages, returning Sunday night. Then Monday going across the country to our various friends, all depending on durability of Ina and Steve. 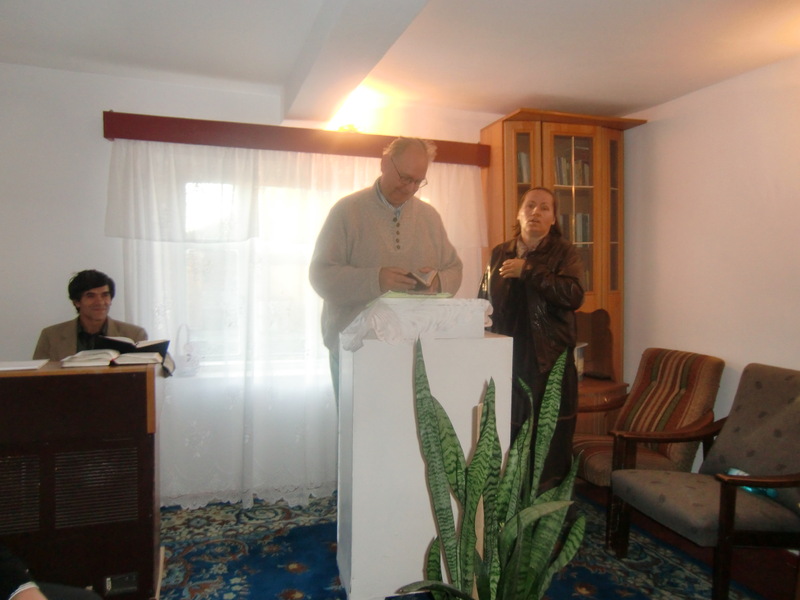 Thursday evening was service in the Braila Pentecostal Church. Ina and Marin accompanied me and Christina came as well to translate. I preached on the calling of Timothy by Paul and the growth of the first century church. With Christina translating, it went very well. Ina gave a greeting and spoke of her family coming from Moldova area of Romania. Thus was well received by all as she prophesied of the Romanian Pentecostals being flowers of color to the world for Christ. Friday afternoon was chores and then around 7 pm we were invited to visit Brother John and his family in the Gypsy Colony. Marin and I went and Ina accompanied us but Steve had to stay in. It became clear it was more than a visit, when we arrived and found about twenty gathered at Johns apartment. A gypsy service was underway and they expected messages and prayer. With small children running about and a plate of cookies and orange pop set on the table for all, Ina spoke again of her Romanian roots and of the importance of providing all you can spiritually to equip your children. I followed with a message on The Prodigal Son, drawing much from my recent reading of”A Tale of Two Sons” by John MacArthur. We followed this with a talk by Marin and then many questions and inquiries as are usual in The Colony. Ina and I then prayed with many, receiving words from The Spirit for five of the adults. One gypsy brother recounted how his heart pains eased on our last visit when we prayed for him last November. I recalled how many of them I had had the privilege to baptize in the Danube! It was a great meeting with much joy as they sang several songs before we left; including all eight choruses of one in particular I still cannot get out of my head. Saturday morning Marin and I picked up the pastor from Chiscan and his teenage daughter and with Christina, headed for the Delta area, crossing the Danube on barge. 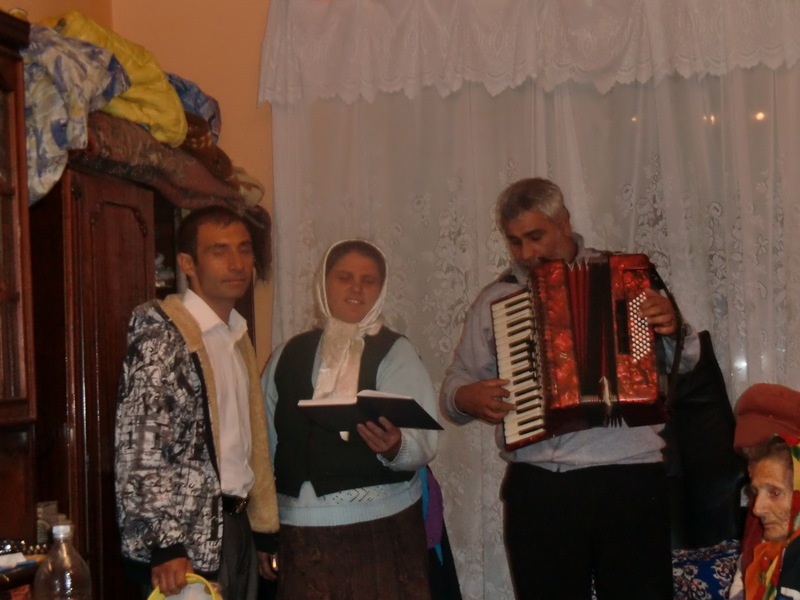 Pastor Aurel of Chiscan is the District Supervisor of Braila area (Southeast Romania Pentecostal Churches) and wanted to bring foreign visitors to the new Delta churches. Actually, I had visited these same churches last year but it was fun to return to them as they do not get many visitors. Ina and Steve stayed back in Braila and Christina’s brother Dan came all the way from Iasi (6 hours!) on the train, along with three of his children, to look after Steve while we were away. 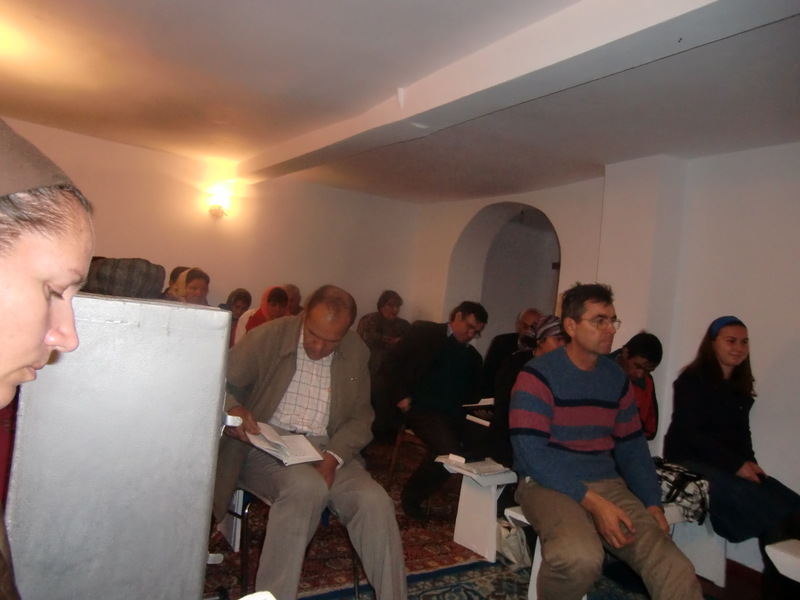 The first village church we visited was Hagarda, a Turkish village. I preached the same message in all four churches, the Seven Curses removed by the blood of Jesus at the Cross. This village church was quaint and very receptive. They served homemade cake after the service and then a dinner consisting of bread, black olives, sheep cheese, salami slices, tomato slices and Danube caviar. The caviar looks like a yellow pudding having the appearance of rice pudding. It is not expensive and is treated as a spread heaped on bread. 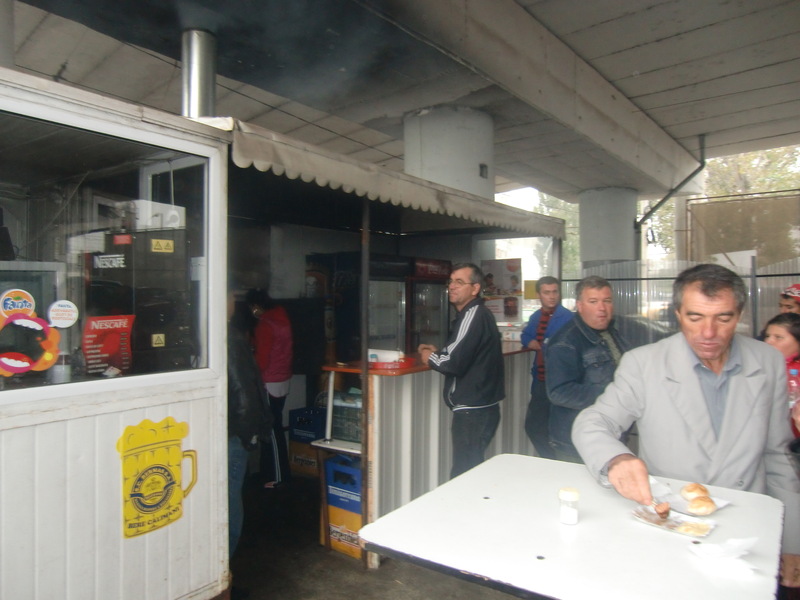 This is a very common meal here for breakfast, lunch or dinner as it is across Romania. Because of the caviar, I elected not to eat anything as there was no way to prevent contamination as to my allergies. From there we visited just outside Tulcea in a small new church. A lady translated for me, giving Christina a rest. This was a mistake as later when we settling in for the night, Pastor Aurel asked me if “I truly believed Jesus drank four cups of wine at the last supper”. He said the Pastor corrected this impression at the close of service. We had a great laugh over it. 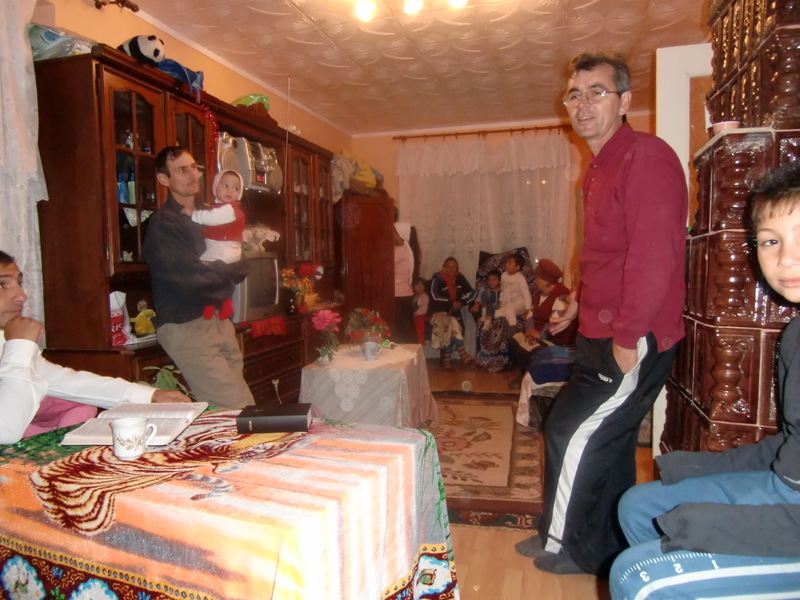 I stayed the night on a hide-a-bed at the home of Pastor Emanuel in Tulcea. It was three flights up which were a challenge but I made it on these old tired legs. The others went elsewhere to sleep and we reconnected at the large Victoria Street Emanuel Church in the morning for the Sunday morning service. The Pastors wife translated again. Following lunch Pastor Emanuel and Pastor Aurel and I visited a family on the 6th floor (no elevator!) of another building to pray for a lady with a tumor. The entire family was present and sent us a gift of pastries for our lunch along with the invitation to please come and pray with the wife. The husband proudly introduced us to his entire family, reciting the year each received Jesus and was baptized. He told of his twin brother who lives in Galati, and about visiting a family in Turkey who have 18 children. That family sent a gift of fruit for us as a blessing for the American Evangelist and he insisted we sit and eat the fruit before praying or the blessing on the family in Turkey as well as his family would be lost! We ate fruit (a pear) and then prayed over the lady and then the entire family. In the afternoon we visited a small church in the village of Nikolaie Belaneascu, named for a Romanian Poet. Pastor Fanika was most gracious as he rarely has visitors. Christina translated the message. 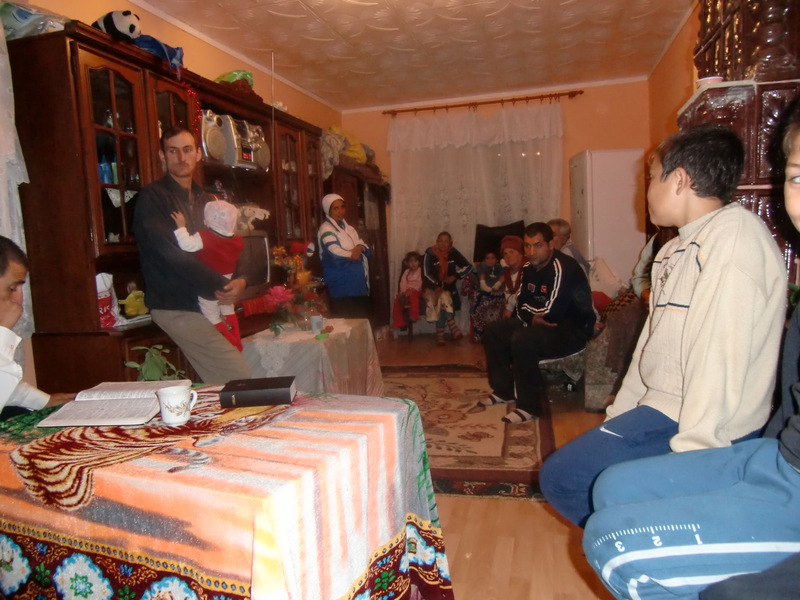 We returned to Braila about 9 PM to find all was well with Steve, Ina, Brother Dan, and the eight children. The nanny Dana had was, frustrated by trying to understand the Americans who were cooking in “her” kitchen. But she got over it! It is now Tuesday am. Vasile is being transported by Ambulance to a Bucharest Hospital at orders of his daughter from whom he has been estranged for many years. She and his ex-wife have obtained doctors in Bucharest and they want his input so it is beyond Marins or Vasile’s control but the family here is noticeably upset. Tomorrow morning Marin and I will start our cross-country visits beginning in Bucharest where we can hopefully see Vasile. If Steve and Ina can come they are most welcome but if not, we still must begin our journey to meet some of the schedule. After Bucharest, we plan to go to Campalung, Petrosani, Jebel, Timosoara, Cluj, Beclean, Bistritsa, Neamt, and Vaslui, returning to Braila by Saturday. Then Saturday evening we are scheduled to go to Moldova for three days. My health remains good and my diabetes well under control although I did have problems climbing endless stairs or standing for long periods of time. God is blessing me mightily on this journey, as always. I will write again probably Saturday. I am sorry to be so late in writing but we have been very busy. I left off last Wednesday with Marin and me starting our journey to Bucharest. Wednesday afternoon, Ina and Steve were able to travel again so the four of us set out for Bucharest. Marin worked at the construction site in the morning and then we left after lunch for the central Romania surrounding Bucharest. We took the northern route above city center as there are street demonstrations in the city concerning economic cutbacks. These often become riots making streets unsafe. Arriving at the Eastern entrance to Bucharest we proceeded directly to the Oncological Hospital to visit Vasile Tiripa, Marin’s brother. He had been removed from Braila by the daughter and ex-wife to Bucharest so their specialists could perform tests and examine him. Marin was permitted to visit with Vasile and reported he was exhausted by the ambulance trip and in great pain. The tests would be concluded by Friday. We then went out of Bucharest and around the city of three million using the circumferential highway, which they call the “beltway” but which Marin calls the “seatbelt way” in his broken English. (It took several trips for me to figure out what he was saying) The Beltway is not elegant or fast. It is a patchwork of old roads put in along military bases to guard the city from attack. It is effective for avoiding midtown gridlock but hardly a highway or even consistent roadway. Used mostly by heavy trucks and freight vehicles, it is cumbersome, long and bumpy. If you can imagine, this highway has four way stops, rail crossings and repeated construction zones. Still, it is best bet for getting to other side of the city from any point. Once we were on the west end, we took the Pitesti Highway for about 35 miles to Bolin exit where we found a hotel for the night. It was around 11 pm and we were exhausted from the drive, having stopped for dinner inroute at a traditional Romanian “popas” (traveler’s rest stop). of Ron and Sue Bates. Ina was a good friend of the Bates, helping establish their ministry in 1990. 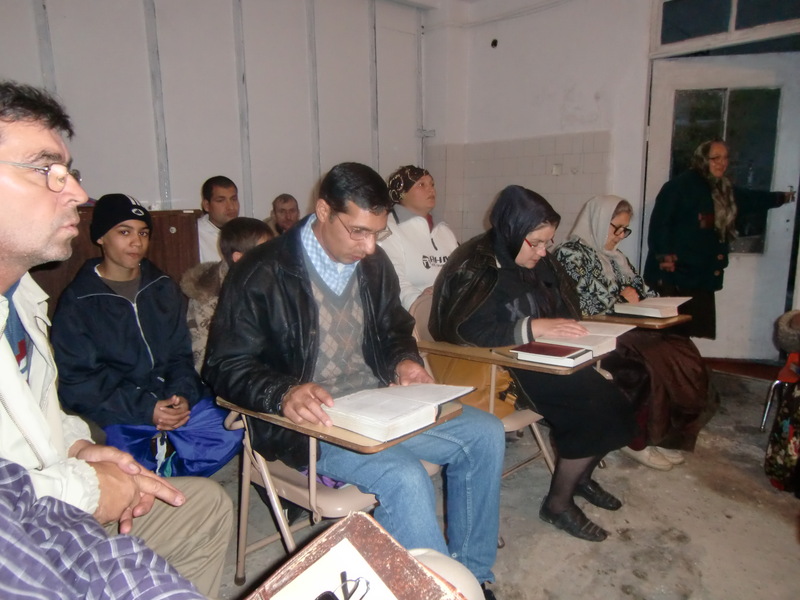 Caleb Ministries partnered with the Bates in feeding the street children, printing the Braille Bible in Romanian, and in sharing offices for several years. Ron and Sue both passed away last year and their ministry continues on under the new banner Jubilee Ministries. Affiliated with a Scottish Patron and a Presbyterian Foundation, they have concentrated on the home for the older girls, closing the orphanage for young boys and the street programs. At Bolin, we found the orphanage/half-way house operating well. Under the supervision of the Bates’ former employee Nelu, the home presently has 25 girls which they have enticed away from Bucharest streets. Situated in this small remote village, the girls range in age from 17 to 28, many with children presently removed from their care. These girls are housed in units of two or four, depending in their needs. Some live in 5 trailers designed as living units, complete with bathroom and shower, kitchen, bedroom, and living room. Each trailer costs 20,000 Euro or $25,000.00 US so it is no small in vestment being made in their lives. Others live in pods of two or four in the main building. They are taught sewing, cleaning, cooking, work skills and social skills so that they do not become prey to the streets of the city. Their education and mental skills run the spectrum. We were very impressed with the facility and the devotion of staff to rescuing these girls, a pet project of Sue Bates for many years. While visiting at Bolin and enjoying coffee, tea, bread and pate’, we were joined by other visitors. One was Ben Skagg, an American from Indiana who has been on the mission field since 1977, presently based in Ethiopia. He is acquainted with our Caleb projects in Nigeria and Ghana and we exchanged information helpful to both our ministries. Another is Tim Bale. Tim and his late wife worked with Ron and Sue Bates in 1990-1993 in Bucharest. He is now back helping put together Jubilee Ministry. We all had a wonderful visit at Jubilee. being served lunch and being taught bible lessons. We had a great visit with mom and the sisters, singing songs and sharing cake and coffee through the morning. Following the two orphanage visits, Ina wanted very much to meet up with her old friend Ruth Crijankowski. Ina knew Ruth in the early 90’s and they worked together in many programs. Ruth’s only son is in Bellevue now and her husband passed away years ago. Some of you may recall Caleb Ministries provided a pace maker for him in 1995. Ina had not seen Ruth since 1995 so we set about hunting her down. We found her living in a large apartment house where at age 92 she ministers to the few surviving friends she has. We took Ruth out for lunch at MacDonald’s and had a great visit, Ina slipping $100 into her pocket to help ease her life. We had to leave Bucharest as it was getting into the afternoon on Thursday and we had hoped to meet up with Doru Cirdei, the Director of Moldova Pentecostal Union who was at a conference somewhere in Cluj. Pastor Doru had invited us to Moldova for Friday through Monday and we had hoped to find him in Cluj so Ina and Steve could ride back with him into Moldova. We drove north towards Cluj but could never get an answer on his cell phone to make the necessary arrangements. Stopping for a short visit in Campalung to see the Orphanage of Rebecca Graham, we were disappointed to learn it still has not opened and Rebecca was in the United States for gall-bladder surgery! It was scheduled to open last summer but still lacked some funding and an approval so was postponed once again. Following lunch at a Hungarian restaurant, we continued on towards Cluj until 6 pm when we found a hotel for the night outside Brasov. We passed Bran (the real Count Dracula’s castle) and Rascov Castles, an enchanting sight for Steve and Ina. Rascov is second largest castle still complete and a major tourist attraction here. We enjoyed a very nice meal and restful night. In the morning I suggested it would be best to turn east to Iasi rather than continuing to Cluj since we were unable to contact him, had no idea where his conference was in that large city, and were only guessing he had room to accommodate two passengers in his car back to Moldova. All agreed and we turned east, going through Bicaz Pass and across the Bicaz River into Bucovina area and the Moldovan hills. By nightfall we had arrived at Iasi at the home of Marin’s in-laws. We contacted Christina back in Braila by telephone and she contacted Doru Cirdei on the internet. He said he was now back in Moldova. He had been trying to reach us on his cell phone as well. It appears the cell phones do not work between Moldova and Romania! Both using Orange Service, and less than 100 miles apart, they could not reach each other nor could Christina reach them on the land line. Ina and Steve were very tired and went to bed as Dan, Marin and I explored the options. Ina wanted to visit Doru and see his orphanage and school and give them $1,000 in person. They were invited by Doru for Friday evening through Monday but it was now midnight Friday. Original plan was Marin and I would drive Ina and Steve into Moldova Saturday but Marin had not obtained necessary Moldova entry permit from Romania police station. He forgot in all the confusion of his brother’s illness, which was understandable. Next plan was Dan would take Ina and Steve in by train on Friday and return Monday. Dan told me this on the telephone a week ago. But now he says he cannot to until Sunday night which is far too late. Dan says they can just take the train because the customs in Moldova have not been checking passports (Americans not suppose to take trains built by Russian funding). I found this very risky proposal with any number of problems such as Doru not meeting them for any number of reasons, some inspector deciding to once again check passports, etc. Because of this, I decide to not have them go unaccompanied into Moldova. The idea of their walking across the border as proposed is unacceptable to me. Last time I did this I was held at gunpoint in Moldova for over an hour by an angry Moldovan soldier who wanted to “kill American!” And the train idea is just too foolish. Finally, it was arranged by internet through Christina back in Braila that Doru Cirdei would drive into Romania from Moldova and pick up Ina, Steve, and Marins’ brother-in-law Dan, meeting us at 11 am inside the Romanian border. He would stay with them the entire visit and he would bring them back Sunday evening unto Iasi in Romania. This was most agreeable as Dan would accompany Ina and Steve, leaving me free to do other work in Iasi. Dan was always available to go Saturday and Sunday but had to be back Sunday night. He confused his English and meant to say he could not go Monday, and always was available for Saturday and Sunday. The exchange was successfully made Saturday morning at the Petrom gas station inside Romania. I then set out arranging Caleb’s’ annual allotment of Christmas Shoeboxes for the gypsy villages and other ministries we serve in Romania. Since the European Union admitted Romania, they declared there were no needy Romanian children and therefore prohibited the distribution of the shoeboxes. For the past three years, Caleb and the Braila Church and our Fundatia Betia foundation have obtained the shoeboxes through Moldova sources for our ministries here. This year I negotiated 3,200 shoeboxes, up 500 from last years supply. Marin will pick them up using his van and trucks in early December. Later I visited Aurel, brother-in-law of Christina’s brother. He started the hydroponic garden program in Iasi Caleb helped fund five years ago. 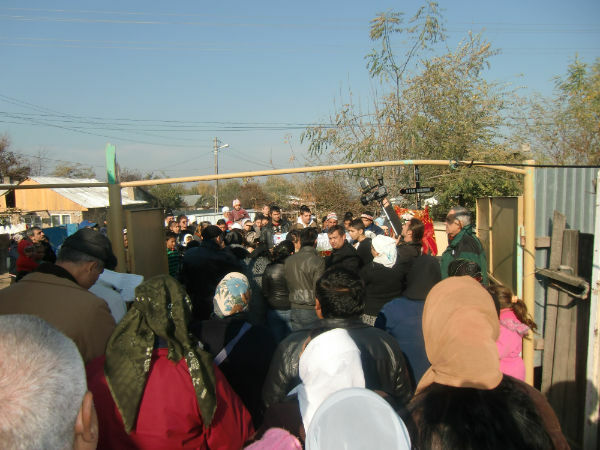 Under the program, villagers were provided plastic greenhouses and supplies for growing vegetables. The produce was picked up in our vans and taken to market at Caleb stalls in big cities and proceeds paid back to farmers less 5% for expenses. The program worked very well and helped remote farmers sell their goods at better prices. The project was stopped by European Union for not using European Union approved seeds or having horticultural inspection of crops, both prohibitively expensive for small farms. Aurel reports his ministry is now teaching courses in subsistence farming to the villagers so they do not turn to growing tobacco for quick money which ruins their farms. Saturday afternoon we learned Marin’s brother Vasile was determined by the Bucharest doctors to indeed be terminal and he was being returned from Bucharest to Braila by ambulance now. Marin and I must drive from Iasi to Braila to settle him in his mothers home as the hospital in Braila refuses to receive him back. Marin’s mother has dementia and has difficulty comprehending what is going on. So we must supervise his being settled in her house as his is unsuitable given five young children. By review, on Wednesday, we drove 380 miles from Braila to Bucharest, around Bucharest and halfway to Pitesti. Thursday we drove 600 miles on country roads to beyond Brasov via Campalung. Friday, we went another 800 miles to Iasi. Saturday, we went 180 miles to Braila after going 80 miles to Moldova border and back. In Braila, Marin settled his brother at his mothers where he is being looked after by family members and church members, and Sunday Marin and I along with Christina and some riders wanting to go to Iasi, returned to Iasi to pick up Steve and Ina, only to immediately turn around and drive back to Braila. 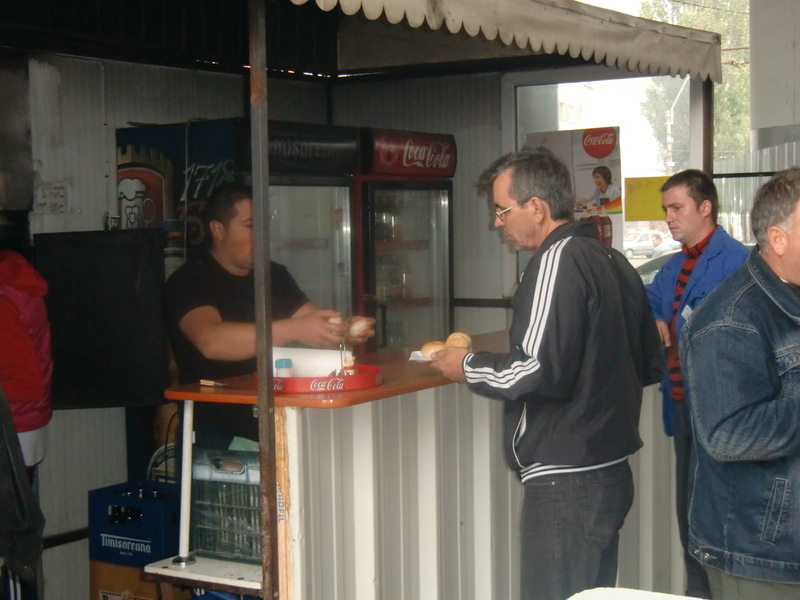 To help with expenses, another couple rode with us to Braila to visit their family, sharing gas expense both ways. As we left Braila, we stopped to visit Vasile one more time. This was provident because he passed on to glory about an hour after our visit. We were on the road to Iasi to pick up Ina and Steve when we got the news. Continuing up to Iasi, we visited with Pastor Doru Cirdei and retrieved our two guests only to them turn around and drive back to Braila to prepare for the funeral. Sunday night and Monday morning Marin and I negotiated with the local cemeteries, purchased the casket and burial clothing, arranged for the meal for guests, and sat vigil at the casket at his mother’s house. Brother Jenney offered me a ride home so Marin could rest. Caleb Ministries purchased the casket, wooden cross, food, and flowers at a total cost of $390.00. Monday night was memorial service at the mother’s house. I preached on forgiveness, judgmentalism and then recounted Vasiles' confession of faith a week ago in the Braila hospital. 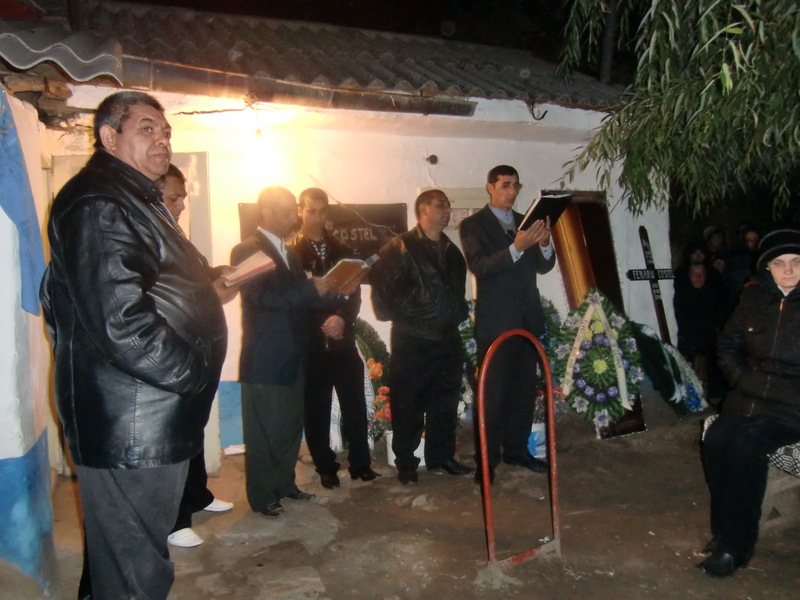 Following the service, we received word the infant son of one of our gypsy families in Lacu Sarat had died in the night. It was brother Jenney’s grandson! Ina and Steve, the children and Christina went back to the house and then Marin and I went to the village to give our condolences. The family was very impressed we would come at this time direct from Marin’s brother’s service. I gave a eulogy for the infant, explained the doctrine of the innocents and that the child indeed would be received by Jesus into the kingdom. The family was so grateful for the visit they assured me word would spread among gypsy clans and I would find safety and shelter in gypsy homes everywhere! Tuesday we picked up the flowers and wreaths, and at noon we held the funeral service at his mother’s house and then held the funeral procession to the cemetery in Chiscan where his brother was laid to rest. I provided the messages at the services along with the Pastor from Chiscan, Pastor Aurel. It was a very long day. 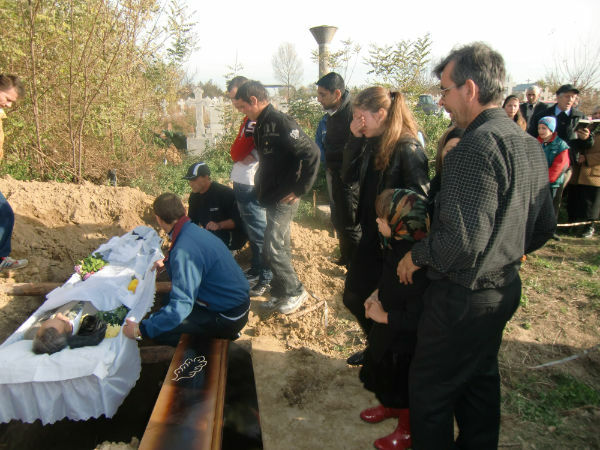 When the coffin was lowered Marins’ mother collapsed and we had to call an ambulance. All of the cars had to be backed out of the narrow cemetery road so the ambulance could reach her, as the coffin was being covered. It was chaotic, hectic and somewhat hysterical for many. Steven and I found ourselves comforting elderly women and assuring them Aurelia would be okay, while Ina looked after the Tiripa children and Christina ministered to her mother-in-law. Marin was supervising the laying of the coffin of his brother. Once calm was restored and Aurelia was pronounced okay, we returned with the crowd to the mother’s home for the traditional meal. At the end of the meal to which all were invited, Tuesday evening after the funeral for Vasile, Marin and I again went to Jenney’s to comfort the family and make the arrangements. 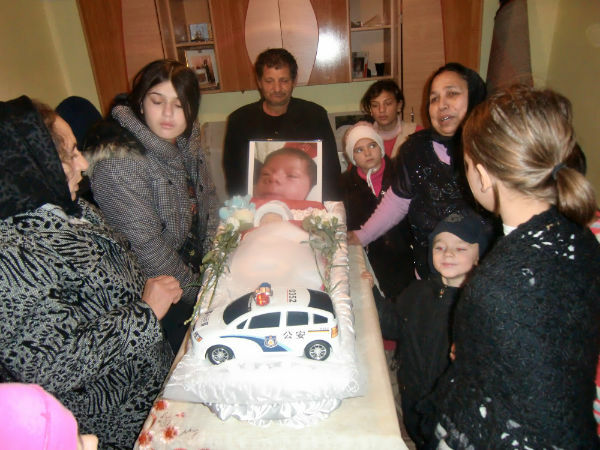 It was now Wednesday and we were preparing the second funeral, this for the one month old infant Solomon Stan from Lacu Sarat Gypsy Colony. Preparations were undertaken in the morning and in the afternoon Marin and I took Ina and Steve to Bucharest to stay the night and then catch their fight early Thursday morning. Staying again at the Bobe Hotel on the Pitesti highway, we woke at 4:15 to get them to airport by 5:45. We then rushed back to Braila just in time to conduct the services and burial for Solomon Stan, age 31 days! The family was very grateful for our work and told me I will always be “gypsy” to their family and welcome anywhere anytime. We are exhausted. I fell in the cemetery at the last service when my left leg gave out but several helped me up and few noticed. One lady yelled for Marin but I was up before he turned to notice so he did not know. One less thing for him to worry over! It is now Thursday evening and I rest. Friday morning and thankfully time to write my report. I am so sorry it has taken this long. 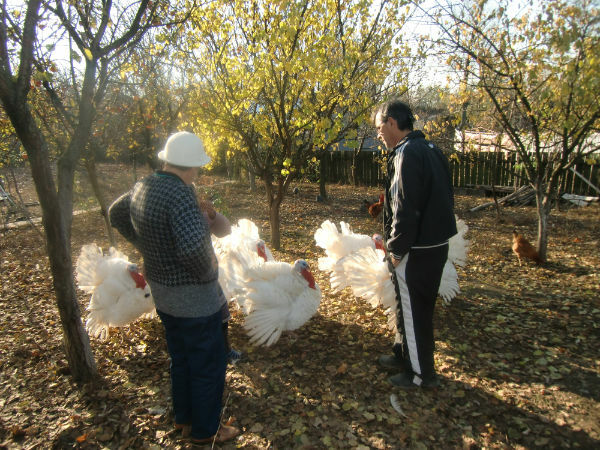 Christina just visited and told me Marin and I leave for Vaslui in an hour to kill sixteen turkeys for a lady. In return, we get paid 3 turkeys for winter food. 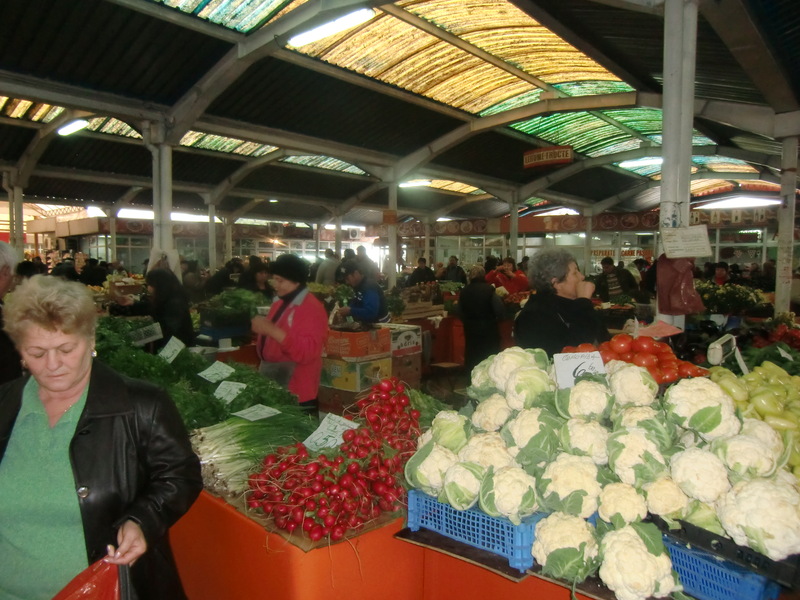 Then we go on to Iasi to pick up sacks of apples, complete a land purchase to start a new house construction, and then return to Braila probably Monday. We left for Vaslui Saturday Afternoon with Marin’s mother-in-law going with us. Stopping in the village of Cortesei, about two hours out, we traversed mud roads suitable for horse carts, finally arriving an a farmhouse. It is the home of the mother-in-law of Dan, Christina’s brother, who lives in Iasi. She has EIGHT Turkeys. The deal is we kill one and take it to Dan and the rest are ours for feeding the gypsies, to be delivered by Aurel to Braila later. We do in one big Turkey, I performed last rights and Marin and a neighbor shortened it by six inches. We then packed it in a plastic tub and took it on to Iasi where it was dressed appropriately. Marin conducted some business about building another house in Iasi. 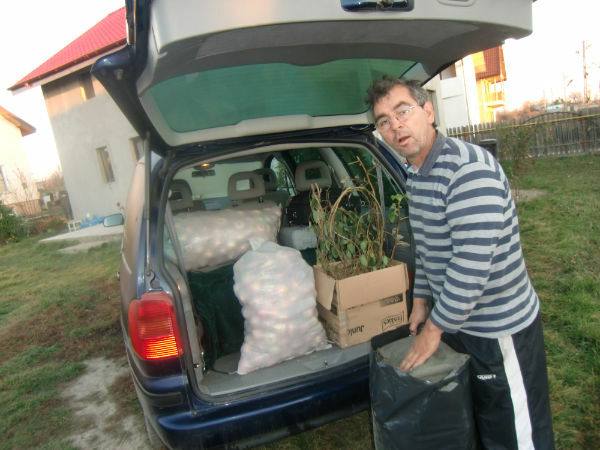 We stayed the night and then loaded the van with apples, pears, potatoes and clothing to bring back to Braila. When I am in town Caleb buys the das and we bring many goods from our travels back to Braila for the church and gypsies and missionaries. Sunday morning breakfast was particularly awful…..brown bread with turkey liver pate’…..and marinated mushrooms. Try that with very strong coffee some day! 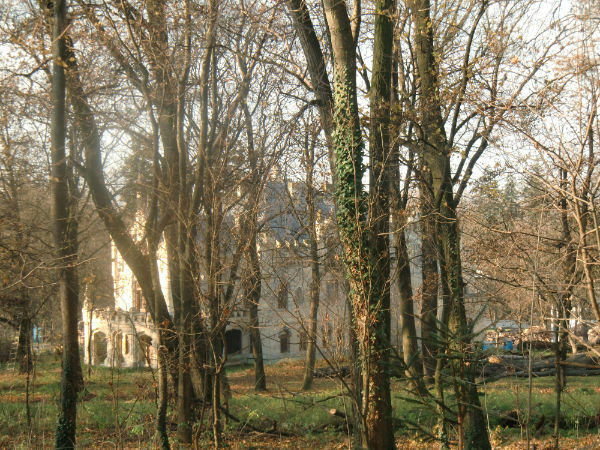 In route home, Marin took me to the Castle of King Sturdza, hidden on monastery grounds about 85 kilometers from Iasi. There are 8 kings of Romania buried there, the last dying in 1472, King Sturdza. I stood in the amphitheater and preached to them Sunday AM but no one responded…. 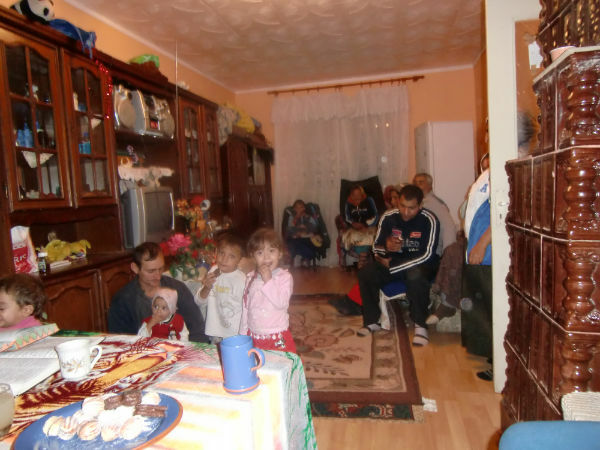 Sunday afternoon we arrived home at 3 to find we were expected at Brother Nics’’' home for dinner in Galati at 3! We rushed the 45 miles north with the family and were treated with a fine mean of Chorba, chicken, mashed potatoes, and pickles and pickled peppers. The twelve children serenaded us with several songs and it was a pleasant evening. One of their children is Downs and has been on Glycobears through Caleb and they always try to thank me each journey. Monday was work day for Marin. I read and did chores. Monday evening Brother Metika asked to come and visit with me. Marin and Christina graciously agreed and translated for me. Brother Metika always likes to come and visit and pray with me but has been on the outs with this family as he owes $6,000 and refuses to pay it though asked repeatedly. Marin needed the funds for his brother care but Metika just avoided his calls the last two weeks. I felt it was most gracious to be cordial in his visit with me. He came to ask questions about several subjects, bringing two friends with him. 1. Does one have to be baptized to enter Heaven? 2. Why did Paul speak of winning the race so much? 3. What are the heavenly rewards and how do we earn them? 4. Should people be allowed to prophecies in church services? 5. Why are some churches not growing? 6. Is circumcision necessary to be a Christian? 7. What are the qualifications for a pastor? 8. Are death bed conversions real and are they “fair”? You can see it was a long evening. Brother Metika left the organized church years ago and struggles with his home church because he is very bothered by hypocrisy. Years ago he use to be part of Marins church and Caleb. He started a second hand store with Caleb supplies. (Romania permits ministries to sell up to 10% of donated goods to cover their expenses so brother Metika did without consulting anyone. He had a key to our warehouse and just “did it”! When asked about it he refused to say how much he sold or what became of the money, saying “You don’t trust me”. His key was taken away and he left the church but remains a friend! We closed in prayer about 1 AM. It was a good evening! Tuesday did not go as planned. We took Marins’ Peugeot Truck to Greci, across the Danube River, with plans to bring back firewood for the winter for several homes. We left early, having breakfast before leaving about 6 AM. Marin’s father went with us. The truck started running poorly while we were on the barge crossing the Danube. It lost power and we had to be pushed to start it to get off at the other side. Once we reached the church at Greci brother Nelu was there to help look at the engine problem. He recommended the battery be charged and went home and retrieved a charger. While waiting, we noticed a letter nailed to the door of the house. The church in Greci is the first one built from ground up by Caleb. It is located on a large lot with an old farm house and large gardens. We drilled a well, the first in Greci, several years ago and opened it and the gardens to everyone in need. 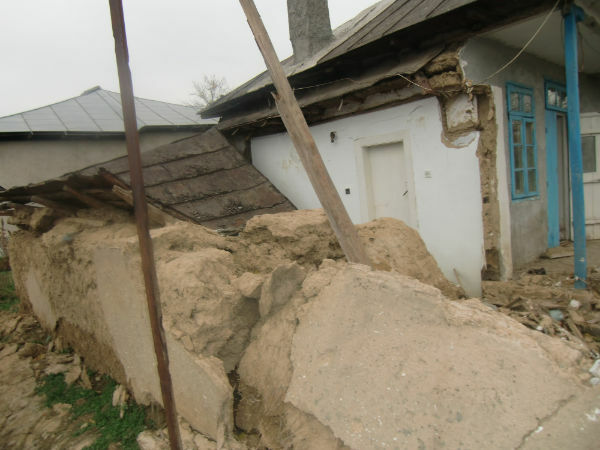 A month ago, Greci suffered severe flooding, destroying the barn and farm house completely. The church was and is unharmed. The note was from the mayor of Greci, advising that since we are a Pentecostal Church, we are not entitled to relief supplies to rebuild the farm house. 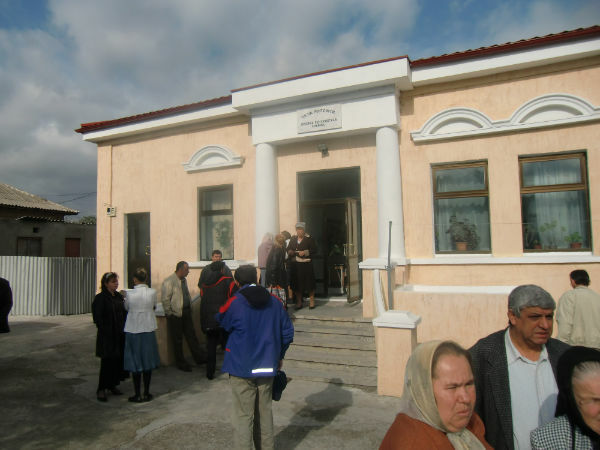 All others got building supplies, including a Seventh Day Adventist Church and the Orthodox Church, but we were denied. Marin’s father and I marched up to the mayor’s house to register our protest. The mayor said the house was unoccupied but we pointed out we have a new pastor coming with family to stay and they require the house for living space. He said the house was vacant presently and then I surmised aloud that the property is listed agricultural (for the gardens of 2 acres) so actually as fenced and unusable as a home I could just move in about 40 pigs and raise them there instead. (The mayor lives across the street) Without hinting he understood my comments, her suddenly agreed to supply goods sufficient to reconstruct the house. We were then given two hours to collect our supplies from the city storehouse. We drove the van, limping all the way, to the city warehouse where it was loaded with bags of concrete, cables, sheetrock, insulation, tin roofing and other supplies sufficient to build a 2 room house. (The former one was four plus stables but we were not going to quibble) We decided it best to take the suppliers back to Braila so they would not be stolen from the lot until we can rebuild in the spring. (A new pastor has not been found yet and Nelu is operating the church with Marin preaching Sunday morning and Wednesday Evenings. 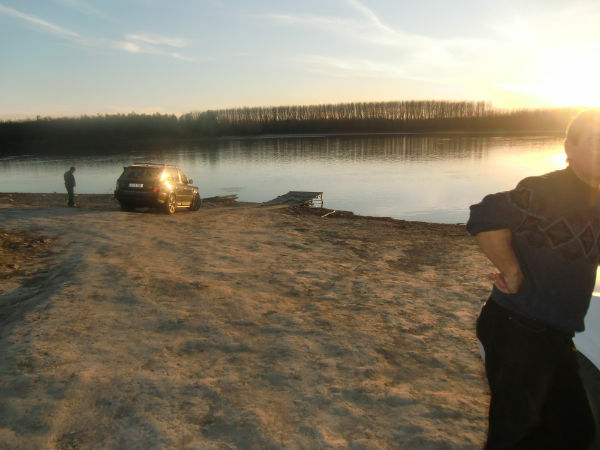 We then drove the van back to the barge to cross the Danube back to Braila. 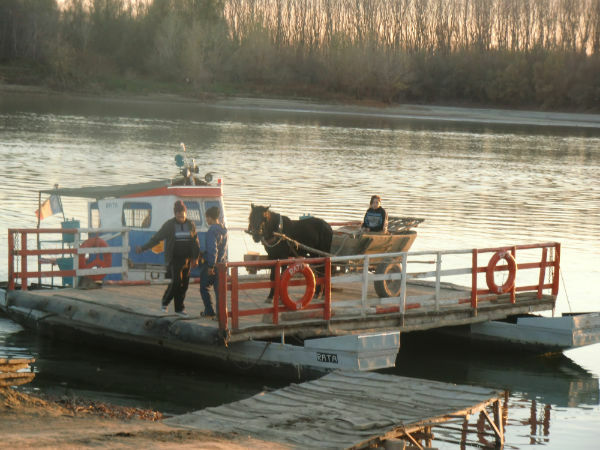 Inasmuch as we were loaded with heavy supplies, we were not permitted on the car barge and had to cross on a heavy barge operated by the Romanian Navy, reserved for trucks. This was quite a treat. The trucks are lined up according to weight and size and then carefully placed on the barge in key positions. We were second, being very small in comparison, and because we now had to be pushed to start and our lights were not working! (The navy was kind to even let us on!) The loading technician then called out the next truck he wanted, assembling the candidates in a parking area. He called for a heavy but short truck. Placing it on the river side, he called for the next, a long truck. He placed the small truck on the river side and as the big truck got its front wheels on the deck, he had the small one cross back to the river bank as the big truck finished getting on, to keep the barge from tipping over! This process was continued over and over until the last truck got on. It was very heavy, requiring TWO small trucks to cross from river side to bank side as he entered the barge. The barge dropped TWO FEET below the loading ramp as his back tires arrived on the deck! The Tech then maneuvered each to his desired location and we set off across the Danube. It was now dark of night. On the Braila side we were pushed again to start and made it up the hill from the barge onto the roadway. There, we were stopped by the police for having no lights. Duh….what lights? After examining all of our documents and accepting a “gratuity” of 200 Ron ($65 US) the policeman left. All this while we kept the engine running on the hillside in the outside lane of a four lane road. As soon as he left, the truck coughed and stopped dead! Help arrived about 20 minutes later and the truck towed by tractor to the house. It was now 9:30 PM and my breakfast had worn very thin. Marin made me a salad and we all went to bed very tired! Wednesday was holiday (Saint Michael Gabriel Day!) so Marin worked in the truck. I showed video of the “Exodus from Egypt and through the Deserts” from THAT THE WORLD MAY KNOW series to about 25 folks from the church with Christina and Livio and Cornell providing some translating after each sequence. It was very well received. Add to this the viewing of 20 episodes of That The World May Know DVD series and three audio teachings by Stan Smith and you can see I have filled the time nicely. It is very important to “entertain” yourself so the family does not feel guilty about not doing things with you. It is a good devise for making them comfortable about my visit and it allows me to catch up on good reading and prepare my bible study classes for the next few months. Thursday we left for Iasi again but this time with detour. 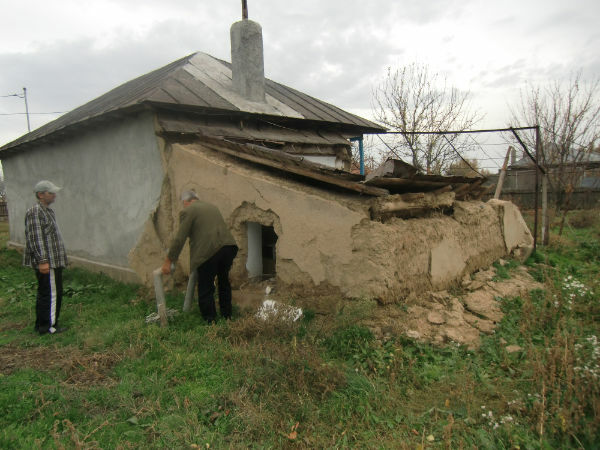 Marin agreed to build a new house in Iasi and had to start the project Friday. He needed to take a worker, Nelu, from Braila to Iasi to start the work. A lady from Braila needed to appear in Court in Piteste on Friday for a child custody hearing involving her ex husband but she had no funds to get there. Naturally, Marin agreed to take her and the baby to Piteste. So at 10 am on Thursday, Marin, Nelu, the lady and her baby set out to drive to Piteste to leave her for the Friday hearing. From there, we drove to Campalung, Brasov, Bicaz, Roman and Iasi, arriving at Iasi at 1 am on Friday! Yes, Marin drove 800 miles in 15 hours! We were exhausted, funding a modest motel with 3 single beds and nothing more in the room. Truly, a one star motel! At 8 we got up and went to the work site where we met the owner, a bulldozer and operator, and another carpenter who works for Marin. We set them to work, got supplies ordered, had breakfast at MacDonald’s, picked up potatoes and cabbages for the gypsies, and drive back to Braila, arriving about 11 pm. Saturday we slept in until 9. Then we went to Big Island, one of two major islands in the Danube outside Braila. Big Island is famous as it was a prison where nonconformists were exiled by Ceaucesceau for not abiding by communism. The monument at the Island states over 300,000 perished on the Island during internment, from malnutrition, disease or poisonous snakes! The island is 80 kilometers by 60 kilometers and now has been cleared of forest and is used for farming. Another client wanted to meet us there to consider building a house. We took three workmen, ventured across the Danube on ferry, and took the 59 kilometer drive on very poor farm roads to the site. After the meeting the workers were situated and left as Marin and I returned by another route we were told was shorter. 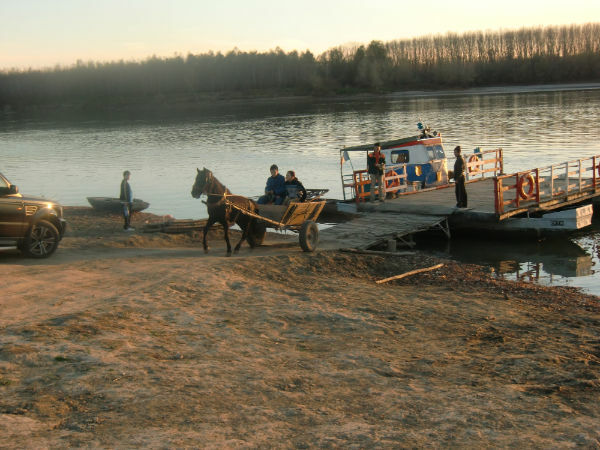 It turned out to be wagon roads, very bad, and arriving at the Danube at a tiny ferry only capable of holding one car or horse and wagon! What an adventure. We got home at 6 pm, Marins father and mother hosted a good-bye dinner followed by desert at Johanna’s house, another friend. Now Marin is free to take me across Romania before I leave for home Tuesday so this will be last report from the field for this trip. I am now back in Seattle, having successfully completed the Romania trip for 2010. Events following the fourth Report went very quickly. Marin Tiripa and I left Braila early the next morning, heading for Bucharest to visit the India Consulate concerning their not granting my visa request earlier in 2010. However, when we arrived near Bucharest we were advised civil unrest was hampering travel in much of the city and we were cautioned to stay away from the consulate area. We decided instead to visit our friends in Petrosani, and heading west. Arriving in the mountain mining area, we learned Pastor Coicheci Gheorghe was away in Spain on vacation. So we journeyed on but found our vehicle being stopped by the police in nearly every town and village along the way. Excuses were given of “warning against picking up hitchhikers”, “safety check for identifications”, and “inspecting licensing documents”. By midnight, we were exhausted and found a cheap motel for the night. There, we learned there was a murder in Piatra Neamt (central-east Romania) the night before and a nation-wide manhunt was under way, explaining our being stopped so often. The perpetrator was apprehended Monday morning hiding in the house adjacent to the shooting. It turned out to be a revenge killing between reputed gangsters. The event showed how serious law enforcement takes incidences of civilians with handguns in Romania! The following morning we visited the Howerton Family in Lugoj, recipients of about 15 boxes of Caleb Supplies since the beginning of the year. We had an excellent visit as we discussed ways to better meet their needs and our expectations. They are volunteers in two psychiatric hospitals for children and find the clothing, games and medicines we are providing very helpful. From Lugoj, we barely had time to return to Bucharest to rest before my flight out the next morning. As always, it was very difficult saying goodbye and expressing my appreciation for all the Caleb Volunteers do within Romania keeping our ministry in the forefront! Arriving at SeaTac Airport from Amsterdam, I misplaced my carryon bag at the airport garage. It contained my laptop, the photos from the trip, my new digital camera, eyeglasses, medicines, and glucose monitor. The 17 hours of travel time makes one less aware and it was not until Wednesday morning at home that I realized the computer bag was even missing. I contacted SeaTac Airport lost and found as many friends undertook prayer for recovery of the bag. 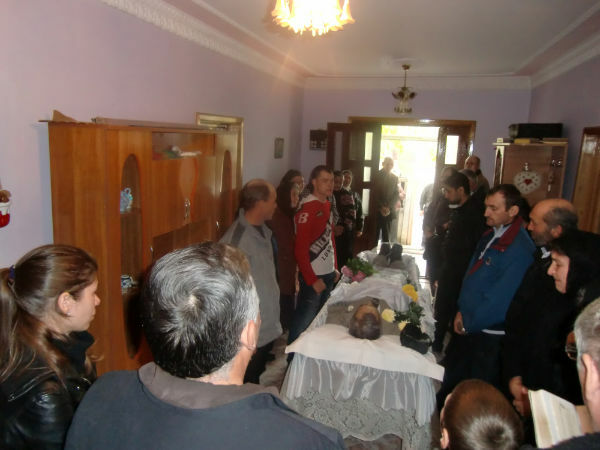 The most critical item was my camera had the family photos requested of Vasile Tiripas' funeral. The following morning I telephoned SeaTac Airport and was advised the bag had been found and was fully intact, having been found by a Port of Seattle Police Officer and turned in. It was awesome that Our Lord looked after the bag and held it secure. I feel so blessed. This trip was memorable for several reasons but among those which standout are being present to help my close friend Marin as his brother went home to glory, the witnessing to the gypsy community of our care and concern for their lost infant, the memorial for brother Paprika who was the first gypsy who permitted me to baptize him back in the early 90’s, and Gods provision in food and supplies for our friends for the coming winter. God Bless you all for your support! Want to get involved or feel moved to help with a donation, or contact a local Caleb group? We invite you to participate with the exciting work God is unfolding. Even if your busy schedule or finances preclude helping directly right now, check out the other ways you can help Caleb just by how you do your on-line shopping or searching on the web!